One of the cheapest web hosting services reviewed to date, Namecheap charges only $9.88 for the first year of hosting. That’s only $0.82 per month! The annual plan renews at only $3.24 per month. In addition to price, Namecheap posted high marks for ease of use, disk space, bandwidth, uptime, and BBB rating. Speed and reliability testing revealed that Namecheap’s Value Plan provided slower than average page-load speeds. Further, the company does not provide telephone support, its money-back guarantee is limited to 14 days, and it has an ‘F’ BBB rating. On balance, Namecheap has earned the NCM Online designation of NOT RECOMMENDED. 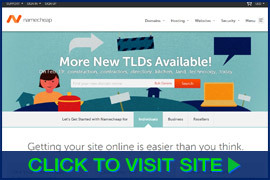 Like GoDaddy, Dotster, Network Solutions, Register.com, and NetFirms — Namecheap is best known as a domain name registrar. And like the aforementioned firms, Namecheap also provides low-cost shared web hosting services. Namecheap offers a choice of four shared hosting plans: Value, Professional, Ultimate, and Business SSD. 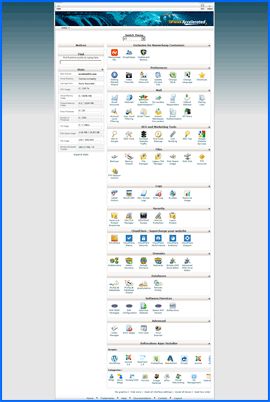 All include a choice of US or UK datacenters; Dell M1000 server technology; the easy-to-use cPanel control panel (screenshot below right); the popular Softaculous applications installer (screenshot below right); 100+ 1-click install apps (including WordPress, PrestaShop, AbanteCart, Drupal, Joomla, phpBB, SMF, WHMCS, Magento, MyBB, Dolphin, Moodle, PHP-Fusion, ClipBucket, Gallery, and many more); PHP MyAdmin; CloudFlare; Cron jobs; Awstats; unlimited parked domains; free daily backups; a dedicated IP address option for only $24.00 per year; Namecheap SSL; webmail access; SpamAssassin; site transfer assistance, and a free (with 1-year term) domain name (renews at $12.88 per year). All four plans are backed by 24/7 chat and email support; a 100% uptime guarantee; and a 14-day money-back guarantee. The easy-to-use Namecheap cPanel Control Panel. Click to enlarge. The cheapest plan, Value, renews at only $38.88 per year ($3.24 per month) for a 12-month plan. It includes 20GB of disk space, unlimited bandwidth, the ability to host 3 websites, 50 MySQL databases, 50 subdomains, 50 FTP accounts, 50 e-mail accounts, 50 e-mail forwarders, 50 autoresponders, and 10 e-mail lists. The next-cheapest plan is Professional. It renews at $78.88 per year ($6.57 per month) for a 12-month plan. It includes all of the Value plan’s features while adding 50GB of disk space, the ability to host up to 10 websites, 100 MySQL databases, 100 PostgreSQL databases, PHP PgAdmin, Ruby on Rails, Logaholic Web Analytics, 100 subdomains, 100 FTP accounts, 100 e-mail accounts, 100 e-mail forwarders, 100 autoresponders, and unlimited e-mail lists. The next-cheapest shared plan is Ultimate. It renews at $129.88 per year ($10.82 per month) for a 12-month plan. It includes all of the Professional plan’s features while adding unlimited disk space, the ability to host up to 50 websites, unlimited MySQL databases, unlimited PostgreSQL databases, unlimited subdomains, unlimited FTP accounts, unlimited e-mail accounts, unlimited e-mail forwarders, and unlimited autoresponders. 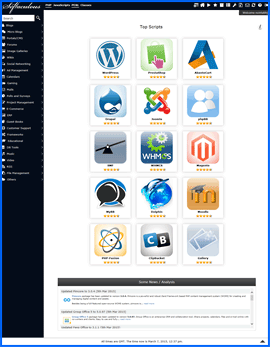 The newbie-friendly Namecheap Softaculous Applications Installer. Click to enlarge. The costliest shared plan is Business SSD. Pricing options include $19.98 per month, $113.88 per 6 months ($18.98 per month), and $215.78 per year ($17.98 per month). It includes all of the Ultimate plan’s features while substituting 20GB SSD (solid state drive) RAID10 disk space, 5000GB of bandwidth, the ability to host unlimited websites, twice daily plus weekly backups, CloudFlare Railgun, PCI compliance, xCache, eAccelerator, personal nameservers, and priority support. While Namecheap’s purchase process is not the fastest we’ve seen, it is simple, thorough and transparent. Amounts currently due, hosting terms and renewal pricing are all clearly indicated. Further, the account you create may also be used purchase domain names in addition to hosting services. As is our practice for purposes of review and testing, we selected the cheapest available plan — Value — and clicked the “Add to Cart” button. The first step is to enter a domain name to be associated with the hosting account. All of the possible options are listed (including the selection of a free domain name), and unlike some other hosts, there is no attempt to confuse you into transferring your domain name to Namecheap. The Namecheap “Welcome” e-mail provides a wealth of useful information, allowing you to quickly and easily set up your website. Click to enlarge. After creating our account, the next step was to pay for our hosting plan. Namecheap Payment options include Visa, MasterCard, Discover, AmEx, PayPal, Bitcoin, and Dwolla. As is our practice, we opted for the PayPal option and completed the checkout process. Within seconds of submitting our order, the PayPal receipt, Order Summary, and “Welcome” e-mails arrived simultaneously in our inbox. The “Welcome” e-mail included all of the information required to access our new hosting account, and set up our website quickly and easily. While providing new customers with complete hosting account information may seem basic, many hosting services we’ve reviewed fail to do so. A screenshot of the Namecheap “Welcome” e-mail is included at right. Using the provided information, we were able to point the domain registrar nameservers to our new hosting account, and upload our test site via FTP within minutes of placing our order — all without having to login to the account or control panel (click for sample test site). Speed and uptime testing began on 2/22/15 and concluded on 3/4/15. We are pleased to report that Namecheap achieved a 100% reliability rating throughout the 10-day testing period — which included 1054 separate server checks (see Uptime Test Results screenshot below right). However, the page-load speed test results were less than ideal. They were in fact, downright slow. All web hosting services reviewed by NCM Online are purchased and subjected to our 10-day test for uptime and speed. Namecheap recorded an average speed of 2.3343 seconds to load our test site from 13 locations worldwide, and 1.8290 seconds from 7 U.S. locations (see Speed Test Results screenshot below right). Namecheap Web Hosting 10-day Uptime Test Results Chart. Click to enlarge. Of the 1088 page-load speed checks performed, 1084 were successful, while 4 failed, On 2/23/15 at 11:55:57 PM our Colorado test location reported a DNS 12007 Error (the host name could not be resolved. On 2/24/15 at 00:09:05 AM our California test location also reported a DNS 12007 Error. 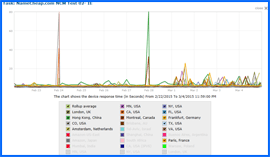 On 2/24/15 at 00:26:53 AM our Colorado test location again reported a DNS 12007 Error. On 2/27/15 at 11:23:05 PM our Hong Kong, China test location reported a TCP 10060 Error (A connection attempt failed because the connected party did not properly respond after a period of time, or established connection failed because connected host has failed to respond). 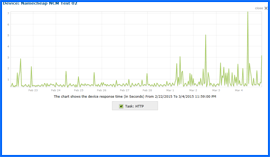 Namecheap Web Hosting 10-day Speed Test Results Chart. Click to enlarge. Of the 13 worldwide test locations, Hong Kong reported the slowest average page load speed — a snail-like 5.7125 seconds to load our 1-page test site. The Texas test location reported the fastest 10-day page-load speed average — a nimble 0.9588 seconds to load our test site. Despite a number of top-notch features, slow page-load speeds, lack of phone support, and a limited money-back guarantee, and an ‘F’ Better Business Bureau rating, prevent our endorsement at this time. Namecheap has earned 3.5 stars and is not recommended. Cheap website hosting company price comparisons based on 1-year term list price before coupon/promo codes or limited time/introductory offer discounts. These are the renewal rates for the second year of hosting. To ensure that you receive the most affordable Namecheap Web Hosting pricing possible, please visit our Web Hosting Coupon Codes page for current discounts and special offers before making any purchases. Namecheap is one of the foremost ICANN accredited web hosting firms and registrars for domain names. The company was founded in 2000 and now manages over two million domains for more than 800,000 clients. The company not only provides some of the most reasonably priced domain names in the business, but also offers comprehensive website hosting packages, secure SSL certificates, WhoisGuard domain name privacy, and much more. Namecheap understands how crucial a domain name is for a business and takes clients’ trust in the company very seriously. The company’s personnel tries to go beyond expectations to make certain clients are content and their hosting accounts and domains are secure and sound. Support staff is available 24/7 to assist customers. Employees are selected for their problem solving skills and receive extensive training. They also are given power and tools and power necessary to rapidly and efficiently assist customers so as not to waste their valuable time. Namecheap operates from several data centers located in North America and Europe. The redundant system architecture of these centers offers a dependable and robust platform for web hosting, domain registration services, email cloud, and affiliated services, including free DNS and URL forwarding. Each of these centers features completely redundant essential systems, including power, network, security and climate control. The company’s domain registration infrastructure features many redundant VMWare-based nonpublic clouds that include HP SAN storage. Namecheap retains a significant portion of its capacity to cover peak traffic events, special discounts, and promotions. The system architecture includes two redundant data centers and delivers a quick and easy domain registration process. The OX Cloud Email platform utilizes a redundant Supermicro driven front-end joined to a NetApp storage backend. The company’s private cloud setup provides security, dependability and redundancy. Namecheap takes both privacy and security very seriously and employs a private cloud to deliver both. Namecheap is dedicated to offering an unmatched level of client support and service. The firm strives to provide simple user-friendly products and the best values in the business. The company promises never to utilize aggressive advertising or pressure customers with unsolicited up-sells. The company personnel see their connection with clients as long term, and therefore seek to be straightforward and friendly in all they do. Whenever possible, they try to save the customers’ time. These efforts are reflected in the company’s slogan which states that it thrives on keeping its customers happy. This video tutorial will show you exactly how to install WordPress on your Namecheap shared hosting account using the cPanel control panel and the Softaculous applications installer.